The Little Picacho Wilderness encompasses a moderately large amount of the desert between Picacho Rd and the Colorado River in the easternmost part of Imperial County. The highpoint is Ridge BM though PB currently has Mala Pais BM, about 50ft lower, incorrectly listed as the Wilderness HP. Both have over 700ft of prominence and seemed reasonable to do in a day. In fact, we were able to tag on a few additional easy ones after that. In the interest of honest reporting, this was one of my least favorite desert outings. The problem stems from the nature of the terrain we covered on the first two peaks. The whole area has seen extensive volcanism and the southern section of the Wilderness is covered in brown and black desert-varnished rocks. The toaster-sized rocks were thrown up in a cataclysmic eruption, littering the ground in what I dubbed, "volcanic vomit." They are no fun to travel over as one has to be constantly aware of foot placement, watching for loose rocks and ankle-turners, with no enjoyable scrambling to found over any of it. The stuff covers many square miles and becomes tedious very quickly. From our campsite adjacent to the All American Canal, we drove up Picacho Rd until we were almost due west of our summit, a little more than three miles away. There is little parking to be found along the road here, but eventually we found a small turnout above the berm on the west side of the road where we could park Matt's Subaru. From here, Mala Pais BM appears as a dark bump on a long, like-colored ridgeline in the distance. The first several miles were across the broad flats of Unnamed Wash (yes, that's actually the name of it, ironically) and this was fairly pleasant with the usual benign desert landscape. It appears that we could have driven some of this as we found ourselves crossing a signed BLM road about half a mile from Picacho Rd. I have no idea how to access this road, however. It was only upon reaching the base of the main ridge that we came upon the volcanic vomit strewn about the place, leaving little of the earth uncovered and little room for vegetation to grow. We went around a first ridge to the north, knowing our summit was on the next ridge behind us. This took us up a rocky wash/gully before we could climb out onto the NW Ridge leading to our summit. Much boulder and rock hopping/stepping eventually led us to the summit after almost 2hrs. Ugh, ugh. Richard Carey had left a register in 2001 with the second visitor not appearing until six years later - Richard Carey again, it turns out. Masochist? Perhaps. The other entries were all from the collection of usual suspects, to no great surprise. It's just not the sort of peak that invites random visitors to its summit. From our perch atop Mala Pais BM we could see that the troublesome rocks continued the entire way across the Wilderness to the east. Ridge BM was less than 2.5mi to the NE and we had originally planned to do both in a large loop but that was looking decidedly less fun at the moment. I had another approach from the east that we could use to reach the second peak, so the original plan began to fall apart. Most of the others felt much as I did about the terrain, but Scott seemed to find some pleasure in it (or perhaps didn't dislike it as much as us). We made a new plan whereby some could continue across the Wilderness to Ridge BM while the others drove around to the east side to meet them atop the HP. Scott was enthusiastically in favor of the former but soon found himself in an extreme minority. To be fair, I actually considered joining him just for the (mis)adventure all those rocks would bring but I wasn't sure I could correctly get the others to the second TH without giving them my GPSr. Or so I would like to believe. In any event, it would be Scott heading out on his own with the rest of us returning from whence we'd come. We didn't return the same way, Evan talking us into a looping route, heading southeast off the summit initially, before turning west to descend down a gully on the westernmost ridge that we had skirted around to the north on the way up. We had cell contact with Scott who had veered off to tag a bonus peak before heading to Ridge BM, and periodically we would send him some tidbit or he likewise, so it sort of felt like he was still with us on adventure. The most interesting find we had was that of a small plane wreck, a Cessna Skylane that littered the ground with bits of twisted metal, engine parts and such. It was more than a few decades old, by the looks of it. Back across Unnamed Wash, we eventually got back to Picacho Rd and our car around 10a. We then spent an hour driving south, east and back north to the other side of the Wilderness, getting within about 1.6mi of our summit which was nearly due west. We had dropped Evan off back at camp on our way as he'd had enough already, leaving Karl, Matt and I to continued. We didn't take the best choice of roads at the end of our drive and may have been able to get a mile closer, but our starting point would work fine. We headed west up the poor road before joining the better one we probably should have taken. We worked our way uphill to the backside of the Hess Mine, finding an old, abandoned road that helped get us higher up towards the main ridgeline. In time, the road gave out and we found ourselves back on the unpleasant rock we had spent so much effort in avoiding. Once atop the crest, we still had almost half a mile of this unpleasantry to follow towards the northwest and our summit. About an hour after we starting out, we found Scott at the highpoint waiting patiently for us - it was now about 4hrs since we'd been atop Mala Pais BM and he'd beaten us to the second summit by half an hour or so. He reported the traverse between the two as "not so bad," which is Scott's way of saying it sucked. Or at least that's how I wanted to interpret it. There was a benchmark but no register, so we left our version of the latter before heading back. We took a more direct route off the summit in an effort to avoid the endless rock fields, with marginal success. Back down on the old mining road system, an elderly gentleman came driving by on his ATV with a friendly wave, the only other person we'd see while out hiking the whole day. By 1:15p we were back to Matt's car, happy to be done with these two. We drove back to camp for the second time. Scott needed to drive home, so we bade him goodbye. With a few hours of daylight remaining, Matt and I were still game while Karl decided to call it a day and hang with Evan at camp. Matt and I then drove up Picacho Rd for the second time (I didn't really have this all planned out as well as usual, thus the repeat driving up the same roads), this time heading for a few easy summits listed in Purcell's Rambles & Scrambles. 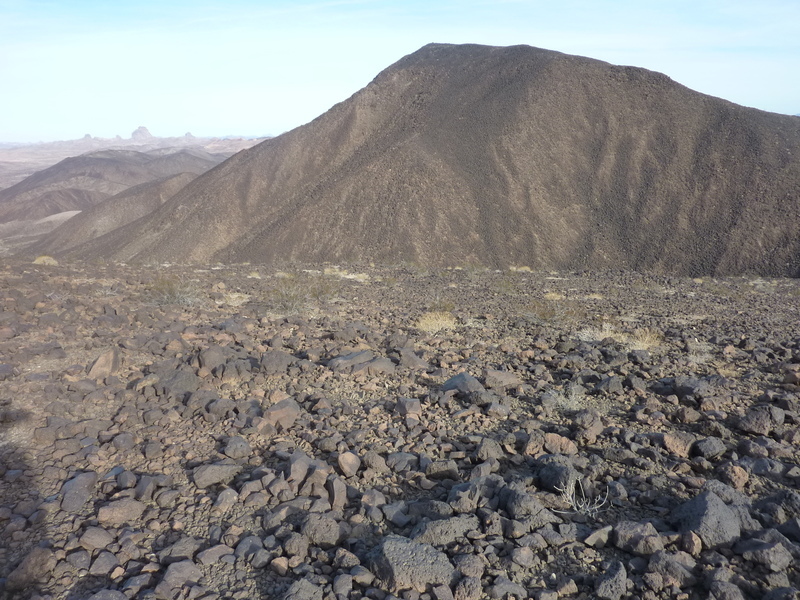 Mine Peak lies about a mile east of Picacho Rd in the same Wilderness, but without the tedious rocks found in the southern part. We followed a pleasant wash or about a mile before climbing 600ft up moderately steep slopes to the summit, nothing more than class 2. There was a large summit cairn but no register - we were fresh out of new ones and unable to leave one. There is a nice view of Picacho Peak to the west, though hazy skies washed out some of the scene. The whole hike took less than a hour and a half.